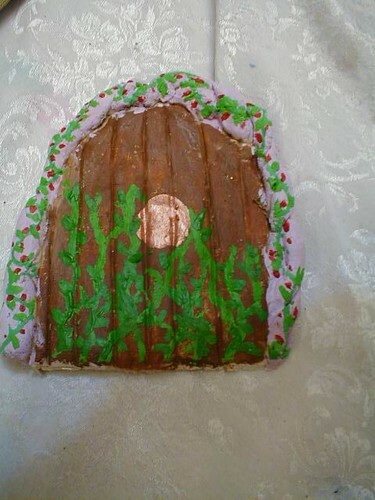 Have you seen fairy doors and gnome doors? 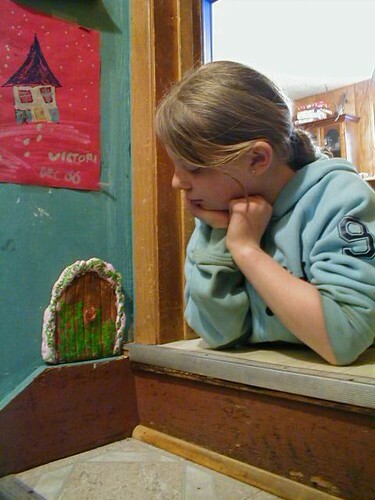 We’ve loved them for years and even have a lovely wooden gnome door against our tree out front. There are some beautiful ones out there but I decided yesterday that it would be ever so fun to have the kids make their own. Anyway! We made them and it made for a really darling craft! 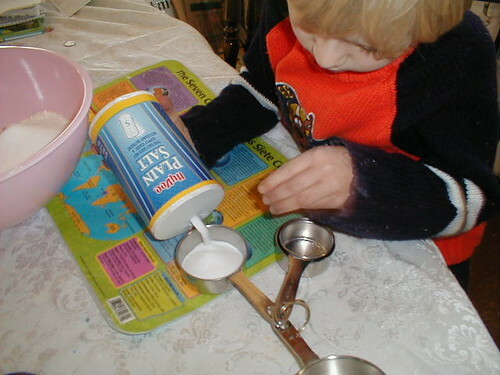 ~ Mix together 4 cups of flour, 1 1/2 cups of salt and 2 cups of water. 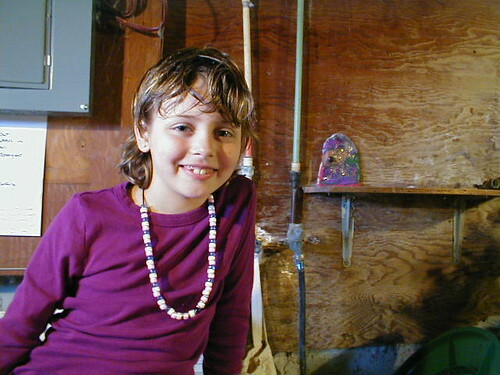 This makes enough for approximately 4 fairy doors, so make less if you don’t want that many. 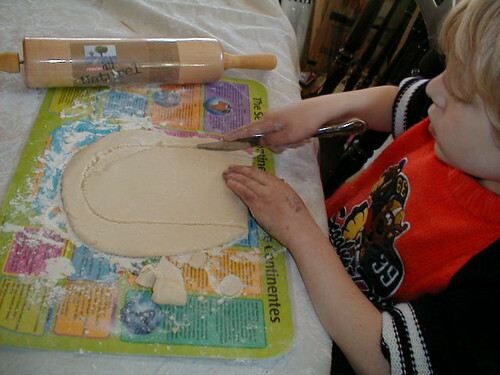 We used our leftover dough for play dough and to make homemade beads (bake them on toothpicks to keep the hole). 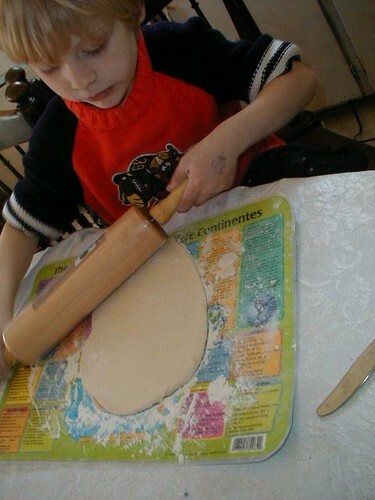 ~ Roll a chunk of dough to about 1/4" inch thick. 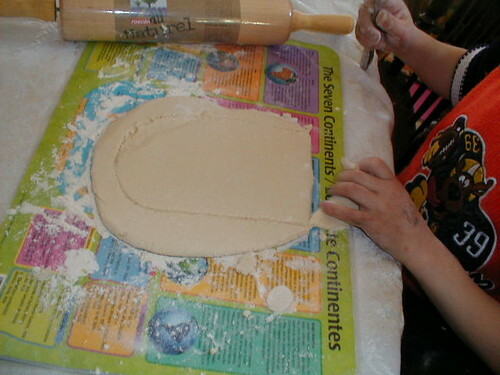 ~ Use the tip of a paintbrush or a pencil to trace your door shape lightly in the dough until you’re happy with it. 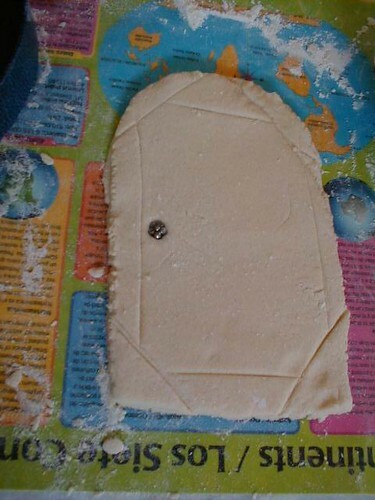 ~ Take a butter knife and carefully cut out your door, being careful to push down with the knife instead of just pulling, so as not to rip the dough or wrinkle it. 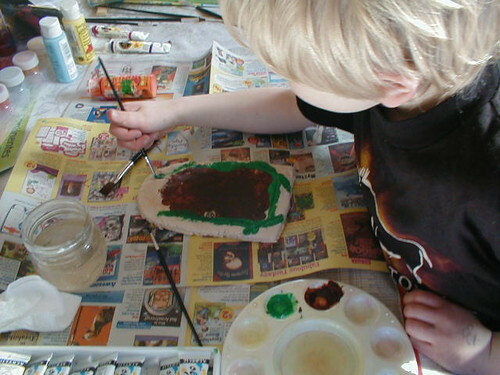 ~ Add any grooves you like (for instance, press a paintbrush or pencil in every inch or so to mimic wooden planks) and a doorknob. 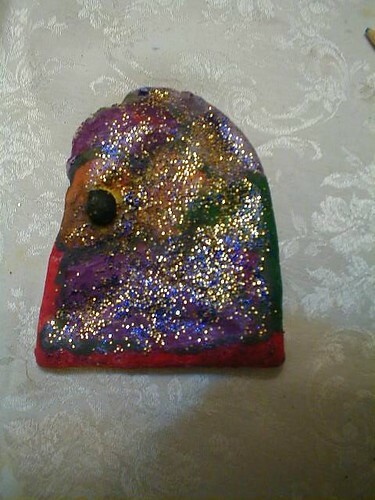 You can make a small dough doorknob or insert something heatproof like a glass or metal bead, a marble or even a small rock. You can also make an indentation and then glue in a pretty bead after it has baked. ~ Bake at 300 degrees, checking every 10 minutes or so, until it is barely starting to turn golden and seems dry throughout. Ours took varying times since they were different thicknesses, but averaged about 45 minutes. If they start to bubble up, you can remove them and poke the bubbling part with a toothpick and gently press it back down. One of ours bubbled up a bit but its owner decided that was just fine so we left it. 🙂 Let cool. ~ Figure out how you want to affix them to your wall. We used two loops of carpet tape and it worked well (do it sideways instead of up and down, so it won’t pull off). 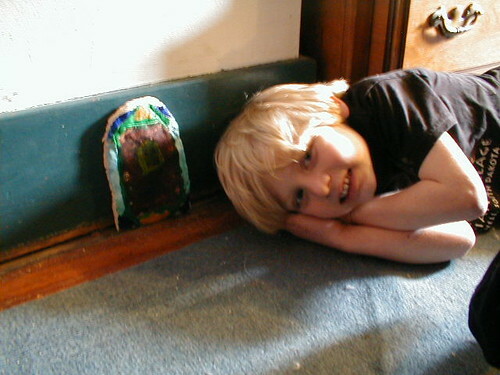 For a more permanent fairy door, you could use some sort of heavy duty household glue. We wanted to be able to move ours. 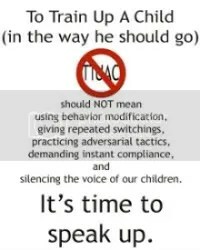 ~ Now comes the fun part! Pick your location! Keep in mind that fairies like to be in places that are rather out of the way. "currently a goblin weapon closet"
It was a fun, basically free project and we now have some sweet little bits of whimsy in various parts of the house. You could obviously really go all out with these and make them very extravagant, too! 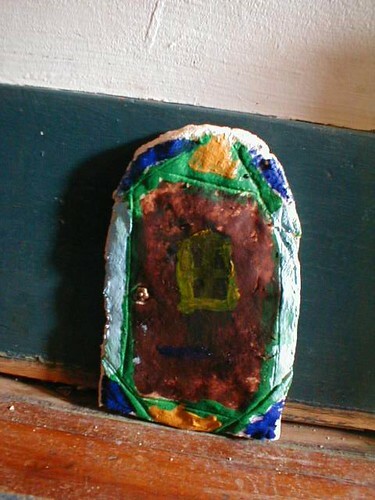 Next time you have a free bit of time and are looking for something magical to do with the kiddos, I highly recommend making your own fairy doors. Perhaps some morning we’ll even find a small trail of glitteror a tiny trinket to show that a fairy has moved in….. 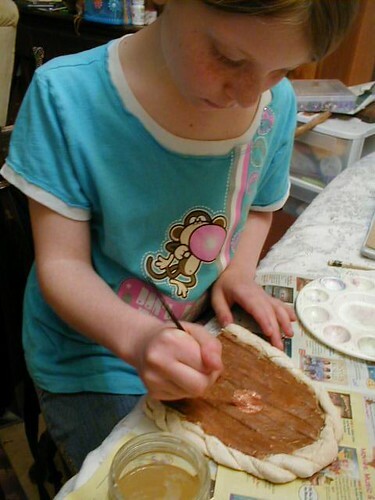 I aboslutely LOVE this craft! I know Sweet and I will be making these next week. She is so in love with fairies this is really going to tickle her! love this!! can’t wait to make them with my grandkids!!! Love this idea! 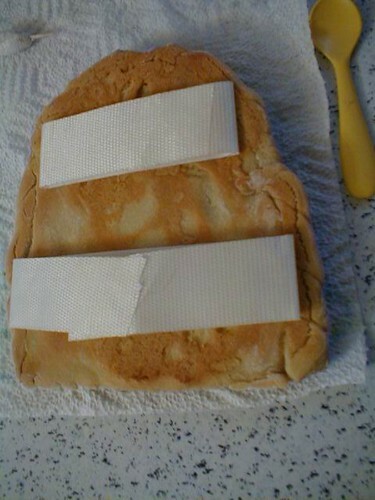 Defo going to try this!